A coffee tables serves the living room environments in multiple different ways hence is considered a crucial need of living room! If it comes with a sensational look, it would be a centerpiece in living room resulting into an enhanced visual room! If it comes with custom built-in storage space then it will maximize the living room storage space also! Besides of all these basic features, a coffee table is preferred mostly to provide a convenient top to sitting members! So you can’t miss all these living room benefits by just missing out a coffee table! No matter if you lack of some money, grab these DIY chevron pallet coffee tables which are all free-of-cost and are full of wooden charm! 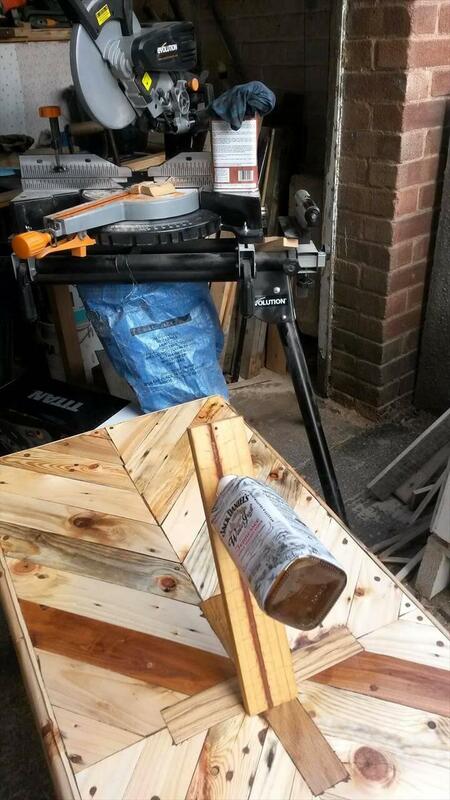 Here the total wood supply will be the separated pallet planks, so just dismantle a few of pallets for it! 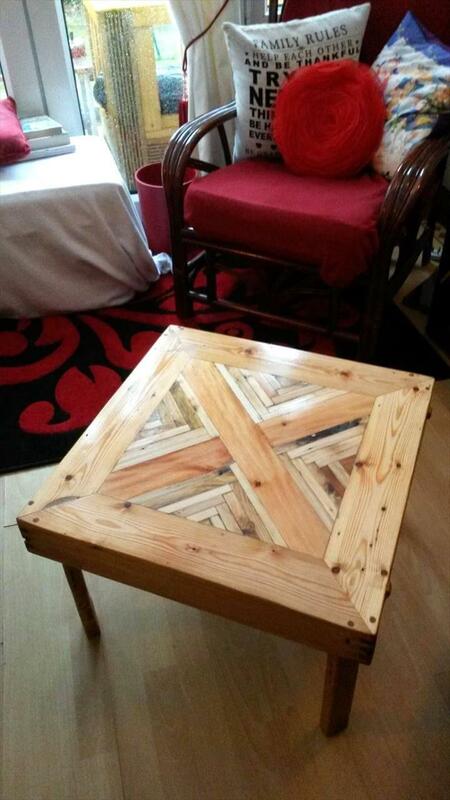 For square top coffee table, just start from the border and then the cross supports inside! 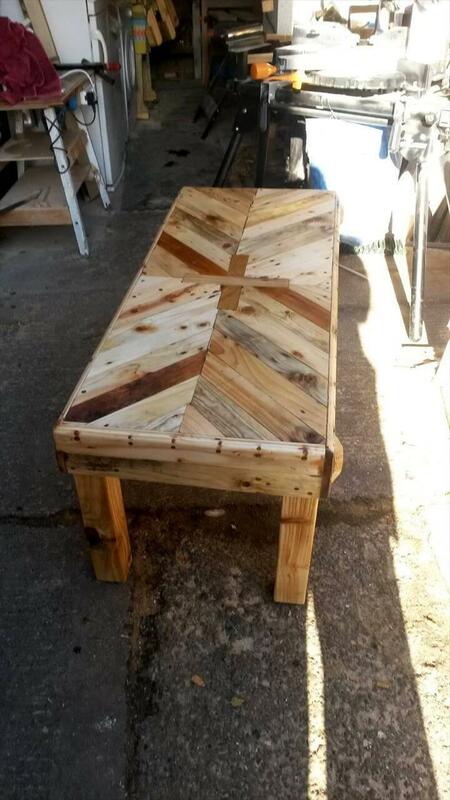 Now just fill up the remaining spaces by going with chevron alignments of pallet slats and take a start from a mini wooden triangle! Now install legs and enjoy! 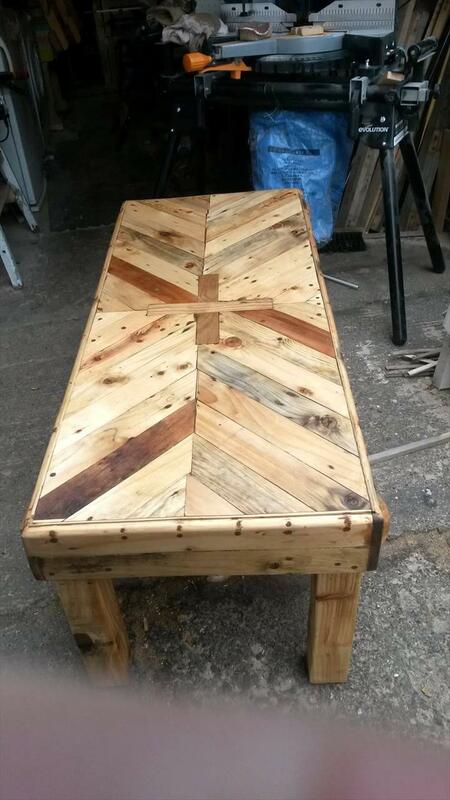 Repeat almost same process for the longer chevron coffee table! 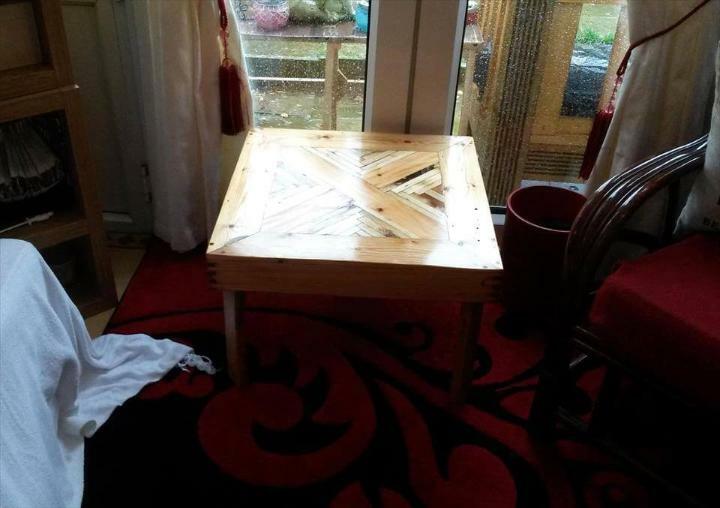 Get this utterly cute and yet simple styled coffee table for your living using the recycled pallet around you for a free gain. 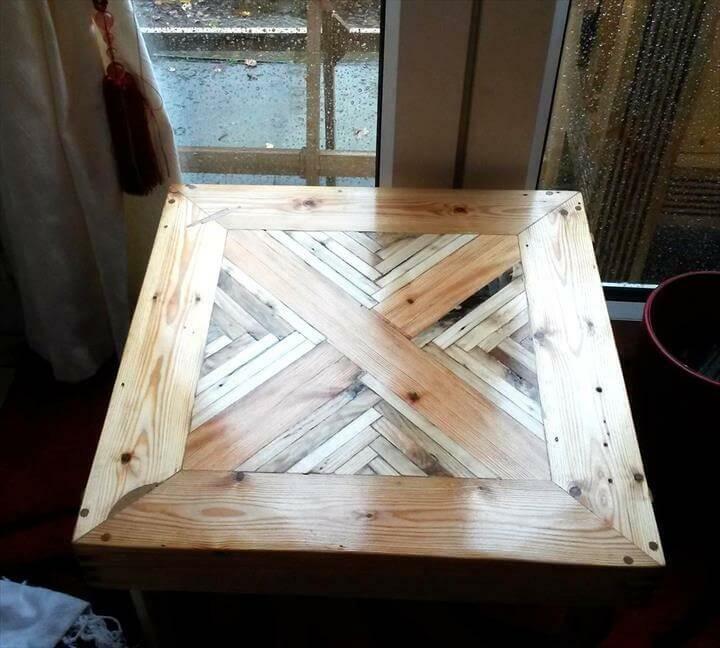 You need to have pallets cut slats and planks to shape up this coffee table having a cute square shape that is damn easy to build of your own. 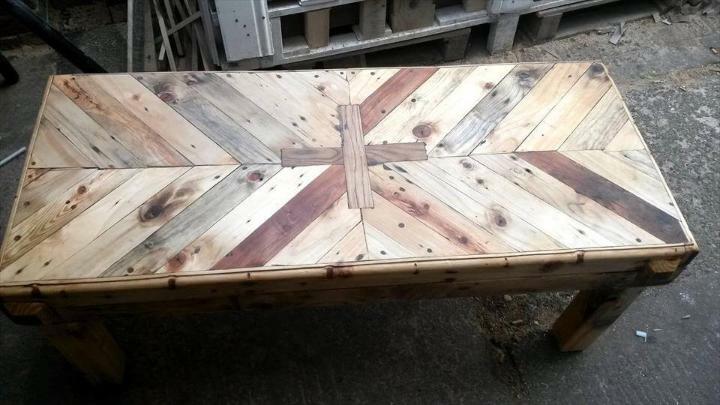 The bigger slats would form up the boundary of the table top and the legs while the small ones have been used to create that impressive cross design in the middle. Keeping it rustic has been done purosefully so that you can bring some natural woody vibes in your living room decor. 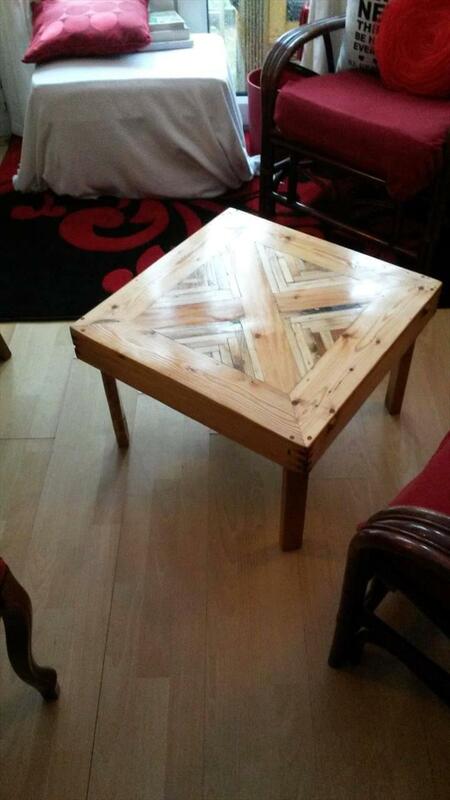 If you think the above mentioned coffee table is smaller then you can build this chevron style coffee table from the same recycled pallets. The pallets have been cut down into lots of pieces to install that lovely chevron pattern on the top with a cute little cross in the center. The pallet coffee table would look really an impressive addition in your living room spaces with a sufficient serving on it big size top. The distress surface of the pallets with marks and tints make it look really a rustic facilitation so keep it same to enjoy its natural beauty look.